a. Sign in to the Office 365 portal. 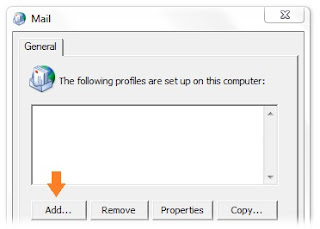 b. Click Outlook to open Microsoft Outlook Web App. c. In the upper-right corner of the page, click the Help icon (the question mark), and then click About. Locate Host name and note its address. This value later will be use as Mailbox server name when configuring your Outlook profile. 2. Manually configure Outlook to connect to Exchange Online. b. Click Show Profiles and then click Add. 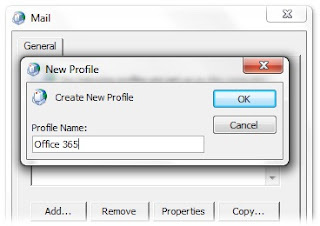 c. Type a name for the profile, and then click OK.
d. Click to select the Manually configure server settings or additional server types check box, and then click Next. e. Select Microsoft Exchange or compatible service, and then click Next. g. Make sure that the Use Cached Exchange Mode option is selected. 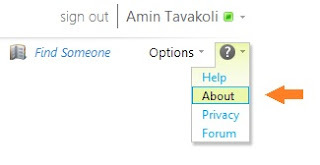 h. In the User Name box, type your user name (for example in this case, amin.tavakoli @pygmalion.com), and then click More Settings. i. Click the Connection tab. j. 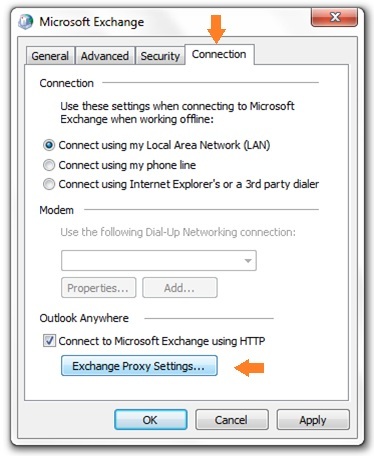 Make sure that the Connect to Microsoft Exchange using HTTP check box is selected, and then click Exchange Proxy Settings. 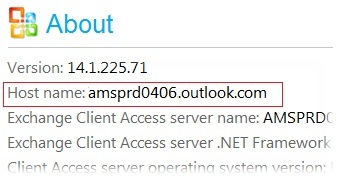 l. Make sure that the Only connect to proxy servers that have this principal name in their certificate check box is selected, and then type msstd:outlook.com. m. Click to select the On fast networks, connect using HTTP first, then connect using TCP/IP check box, and then click to select the On slow networks, connect using HTTP first, then connect using TCP/IP check box. 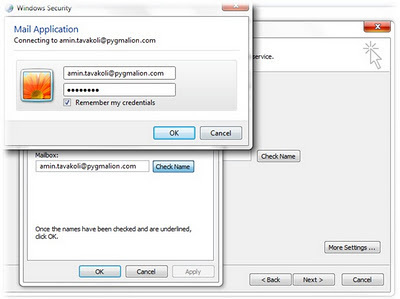 n. Under Proxy authentication settings, select Basic Authentication. o. Click OK two times. p. Click Check Names. When the server name and the user name are displayed with an underline, click Next. 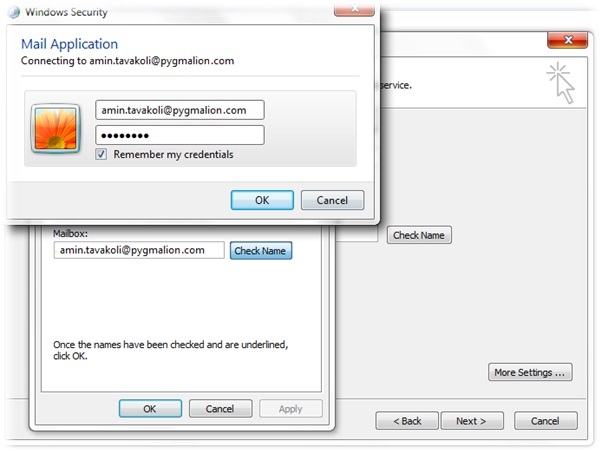 If the Windows Security windows comes up, enter your username and password and make sure Remember my credentials box is checked. Once it is all setup you will notice that both Server and Username fields become underlined. q. Click Next and Finish. For the server address, copy the "Exchange Client Access server name" from the About area. For the exchange proxy setting, still use the "Host name". Highlight and press ctrl+c for copying as right click menu won't work. Hope this helps anyone else here. You did it! Thanks for helping me out. Did you try the instructions here to connect Outlook for Mac 2011 to Office 365? 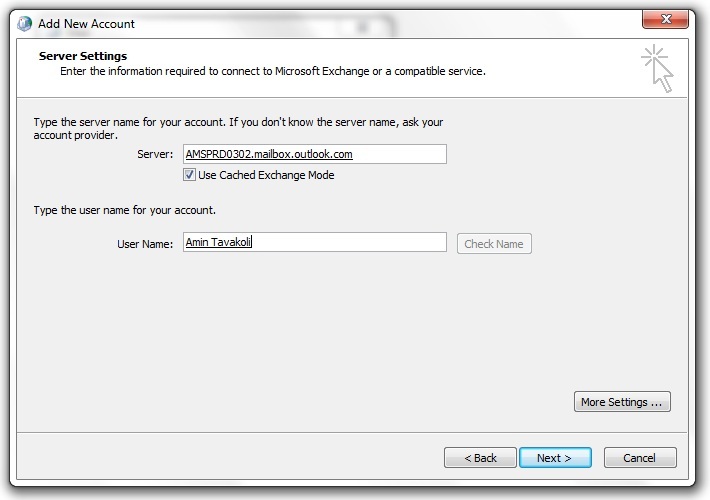 2. in Outlook 2011, enter https://4xample.outlook.com/exchange/EWS in the server name area. I am trying to configure two office 365 email accounts in Outlook 2010 using seperate Outlook profiles but the second account does not work and keeps prompting me for username and password during configuration. Is there a way around it?? 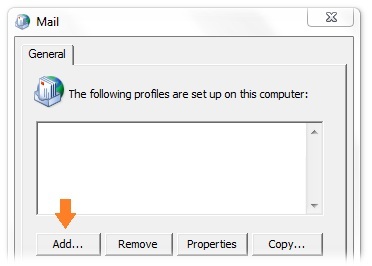 I have Outlook profiles manually setup. Wasted too much time trying to configure manual connection using microsoft KB article. Thanks to mickey.keightley for update, finally it works :). Thanks buddy, this worked great! I found that it kept prompting my for my credentials when trying to resolve the name. If I finished the setup (without resolving the name) and then just launched Outlook, the credentials took and it worked fine. Same here - spent hours trying the autoconfigure etc - this is the only thing that worked. now how do i get my contacts back! Thank you very much - your directions worked perfectly! Worked perfectly! Two days lost trying to connect and now I did it! Thank you! That's the best settings I have seen this year. 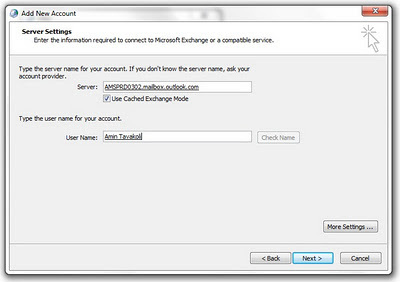 I think you can make even Kiosk accounts to work as 'Exchange' by using this settings in Outlook. excelent post! you saved my life! 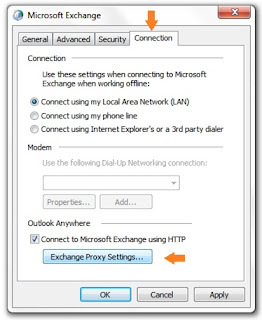 This may not apply to Exchange 2013 as they have changed to use a "connection point" instead of the "mailbox.outlook.com" as server.